For information on various nail pathologies, see Medscape article Nail Pathology. 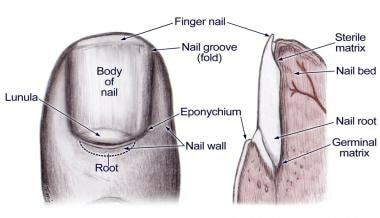 The perionychium is the tissue on each side of the nail, and the eponychium is the skin immediately proximal to the nail. 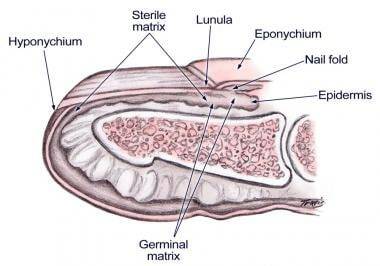 Beneath the eponychium lies the germinal matrix; its distal portion, or lunula, is visible under the proximal nail. The germinal matrix generates most of the nail, while the more distal sterile matrix adheres the nail to the nail bed and assists with nail migration. Injury to the germinal matrix may lead to permanent nail loss. [5, 6] Nail bed anatomy is depicted in the images below. Nail bed anatomy figure 1. Nail bed anatomy figure 2. For more information about the relevant anatomy, see Nail Anatomy. Subungual hematoma drainage is not necessary if the hematoma is not painful. If blood is spontaneously draining from the hematoma, drainage is also unlikely to be of additional benefit. In the presence of acrylic nails, electrocautery is contraindicated until the acrylic nail is removed. (Acrylic nails may be flammable, which is of concern if an electrocautery tool is used.  ) However, needle trephination can still be done if desired. Subungual hematoma drainage does not usually require routine anesthesia. A digital block may be considered for pain control but is typically not necessary for the procedure itself. For more information, see Local Anesthesia and Regional Nerve Block Anesthesia. The image below depicts the equipment for this procedure. The patient should be resting with the finger in a position of comfort on a supportive surface (see image below). The clinician should sit in a position of comfort on the side of the injury. 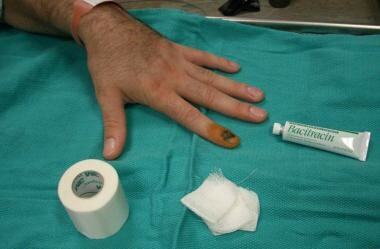 Prepare the finger with povidone-iodine solution (Betadine). See the video below. Using the preferred tool for nail penetration, make a hole at the base of the nail or in the center of the hematoma. This hole must be large enough for the hematoma to drain. If using an 18-ga needle, twirl the needle between the thumb and index finger with slight downward pressure until no resistance is felt and dark blood return is seen from the hole. See the video below. If using a paper clip, first heat the end of the paper clip in open flame. Apply the hot tip to the nail until resistance is no longer felt and blood return is seen. 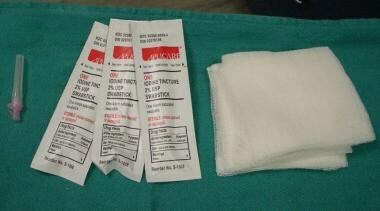 If using a sterile cautery tool, activate cautery until the tip is hot. Apply the tool to the nail as with a heated paper clip. Allow the hematoma to drain. Gentle squeezing at the tip of the finger may facilitate hematoma drainage. Apply antibacterial ointment (eg, bacitracin) over the trephination site and dress the wound with gauze or an adhesive bandage. See the video below. Apply a finger splint for additional comfort. Instruct the patient to avoid soaking the finger and to keep the finger dry for 2 days. When using cautery or a heated paper clip, apply gentle pressure with repeated, quick motions until blood drainage is observed. Applying prolonged constant pressure with heat can result in pain and/or burns. When appropriate, take a radiograph of the finger to rule out an underlying fracture that may require splinting. Always check for the presence of an associated extensor tendon injury. Multiple holes may be necessary to facilitate adequate drainage. Drainage of the subungual hematoma does not accelerate healing or prevent infection. If the heat of an electrocautery device is painful for the patient (which is not typical), an 18-ga needle should instead be used for trephination. Infection may occur if bacteria are introduced into the trephination site during the procedure. Ineffective drainage may result if the trephination hole is not large enough. What is the clinical anatomy of the nail bed relevant to subungual hematoma drainage? When is subungual hematoma drainage indicated? What are the contraindications for subungual hematoma drainage? What is the role of anesthesia in subungual hematoma drainage? What equipment is needed to perform subungual hematoma drainage? How are patients positioned for subungual hematoma drainage? How is subungual hematoma drainage performed? What are clinical pearls for subungual hematoma drainage? What are complications from subungual hematoma drainage? Pingel C, McDowell C. Subungual Hematoma, Drainage. 2018 Jan. [Medline]. [Full Text]. Huang YH, Ohara K. Medical pearl: subungual hematoma: a simple and quick method for diagnosis. J Am Acad Dermatol. 2006 May. 54(5):877-8. [Medline]. Salter SA, Ciocon DH, Gowrishankar TR, Kimball AB. Controlled nail trephination for subungual hematoma. Am J Emerg Med. 2006 Nov. 24(7):875-7. [Medline]. Green D, Hotchkiss R, Pederson W, Wolfe S. The Perionychium. Green's Operative Hand Surgery. 5th ed. Philadelphia, Pa: Elsevier; 2005. 389-416. Fehrenbacher V, Blackburn E. Nail bed injury. J Hand Surg Am. 2015 Mar. 40 (3):581-2. [Medline]. Cotterell IH, Richard MJ. Metacarpal and phalangeal fractures in athletes. Clin Sports Med. 2015 Jan. 34 (1):69-98. [Medline]. Gamston J. Subungual haematomas. Emerg Nurse. 2006 Nov. 14(7):26-34. [Medline]. Hart R, Uehara D, Wagner MJ. Emergency and Primary Care of the Hand. Dallas, Tex: American College of Emergency Physicians; 2001. 191-200. Dean B, Becker G, Little C. The management of the acute traumatic subungual haematoma: a systematic review. Hand Surg. 2012. 17 (1):151-4. [Medline]. Cohen PR, Schulze KE, Nelson BR. Subungual hematoma. Dermatol Nurs. 2007 Feb. 19(1):83-4. [Medline]. Bonisteel PS. Practice tips. Trephining subungual hematomas. Can Fam Physician. 2008 May. 54(5):693. [Medline]. The authors would like to acknowledge the patients who allowed us to use their images for teaching purposes.